Functional and non-functional requirements must be taken into account early in the development process of groupware applications in order to make appropriate design decisions, e.g. spatial distribution of group members and group awareness, which are related to the main characteristics exhibited by CSCW systems (communication, coordination and collaboration). 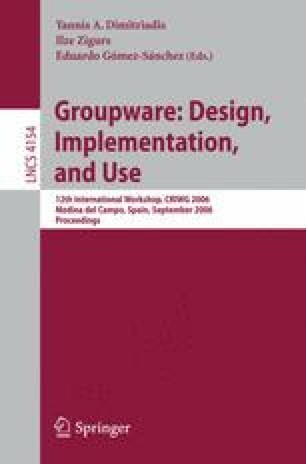 This research work presents a proposal intended to facilitate the development of groupware applications considering non-functional requirements such as reusability, scalability, etc. In order to achieve these objectives, the proposal focuses on the architectural design and its implementation, with emphasis on the use of a realization of the technological Linda coordination model as the basis for this implementation. The outcome is a distributed architecture where application components are replicated and event control is separated. This work is part of a conceptual and methodological framework (AMENITIES) specially devised to study and develop these systems.